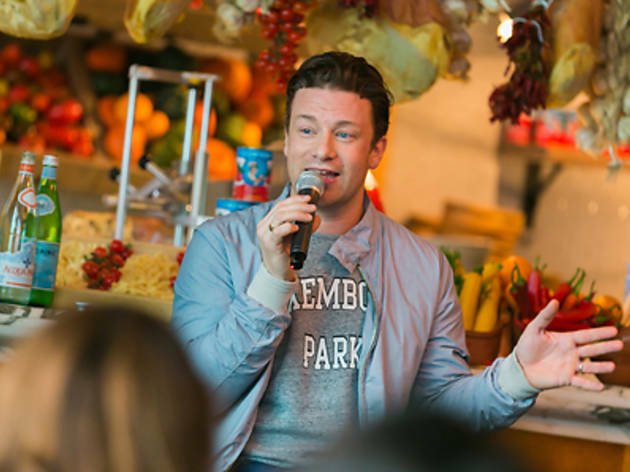 With a global brand of restaurants, a slew of TV shows and a worldwide campaign for food education, Jamie Oliver is a celebrity chef who needs no introduction. 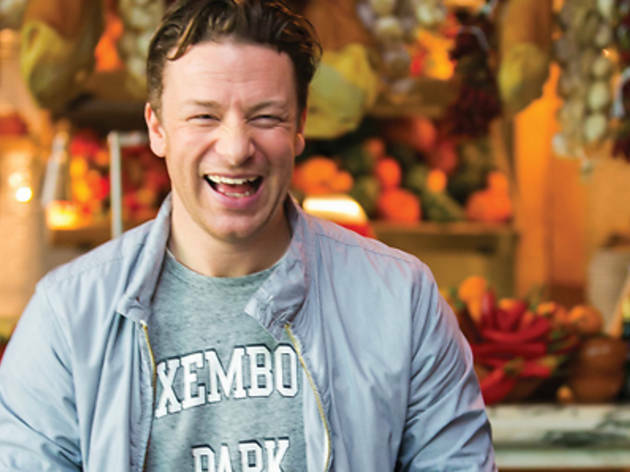 After opening up Jamie’s Italian in Causeway Bay last year, the mega-celebrity Brit chef has just visited Hong Kong about the opening of a second site (scheduled for May) in Harbour City. J: The first thing I ever cooked? Well... when I was about six. I remember my dad teaching me ‘when the oil’s hot, the pan’s hot’. The first thing I probably cooked was a classic English Sunday roast chicken with roast potatoes, gravy, all veg and I did that when I was about eight or nine. You’re known as an advocate for food education. What do your own kids eat? Well I’ve got a 13-, 12-, 5- and a 4-year-old currently. And they’re pretty good. I mean like most kids, they can have their good and bad weeks and go through little phases. Every parent struggles with their kids at certain times, but ultimately we have a lot of fun around food. We go to the markets, we let them make choices, we let them be part of what we’re going to eat for the week. You know we spend most of the time saying no to crappy sugary snacks and obviously trying to get them into the culture of trying new things. My wife is pretty ninja, she’s got it down. I speak to a lot of parents and tell them not to think too much about what their kids don’t like, just concentrate on what they do like and what they might like. It’s the tenth anniversary of your School Dinners documentary this year, how effective has your food education campaign been? I know that you have got programs in Hong Kong as well, what’s your next step? Ten years ago in Britain, kids were going to school every day, eating one – possibly twice a day (breakfast and lunch) – food that’s supplied by the government. That’s 190 days of the year from the age of 4-18, of a child’s meals provided by the schools. In a time of diet-related disease, obesity, you know one in three kids were overweight or obese. We were the most unhealthy nation in Europe. So I did a campaign that raised the question of why do we treat our children – the future of our country – in such a bad way. The food was all processed, all bad quality and there was no love or soul or education involved in it. The result was quite funny because at the beginning we struggled to get access to the government, but after the first documentary went out, I could get an interview with the Prime Minister within a week, so it was a very powerful campaign. Eventually, we found 500 billion pounds over six years to invest in the food system that hadn’t been invested in for 40 years. Now – broad-stroke terms – all the standards were raised at least a minimum of 30 percent. Another success story is that we have been campaigning for about six years to make it law that every single child learns to grow and to practically cook in school, and that law was passed last September. Our next plans are about harvesting the power of our Food Revolution Day – this May 15th is Food Revolution Day and we want people – including people of HK – to sign a petition asking for it to be law in all countries to guarantee that children are taught about food, where it comes from and how it affects our body. We think it’s a child’s human right to learn these at school. What do you think will be the main occupation in terms of food in ten years? What will we be looking at? I think in ten years, it will be an amplified version of what we have now. I think more research will be out and more data will be out. The prevalence of specific diseases, diet-related diseases are responsible for about 68 percent of most people in hospital in the Western world. Last year was the first time in world history where more people died from eating too much of the wrong stuff than having too little. But this is the kind of big moment in history where really not enough people are talking about it. I work in countries of famine and I work in countries where they eat too much of the wrong kind. And this is a very uncomfortable position to be in – how would I justify it or how do I have a conversation with you about two such desperately awful things. This year we’re trying to get people to sign that petition – it’s a global campaign and then I’m gonna take it to the G20 in Turkey and present it to the governments there. Now we’ve got seven on board and have signed up to have compulsory, practical food education already. There’s another 25 that we need to get. As you know with politics, it’s a bit of a game – there’s about three or four that might be on the edge, once we get those, hopefully the others will follow. Your restaurants are famous for focusing on quality eco-friendly ingredients. 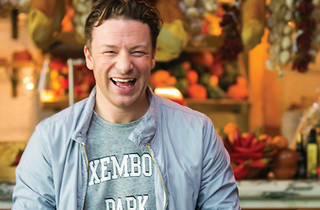 Where do you source most of the ingredients at Hong Kong’s Jamie’s Italian from? The sourcing for the Hong Kong branch is quite mixed for various reasons. We focus on a lot of ethical issues like sustainability, traceability and not using certain pesticides. In that respect, we’re quite hard to work with. For example, there’s plenty of fish we could buy here but we can’t buy pork because there’s none that’s approved by our in-house standards. So everything you see here is actually a mixed bag. If there’s one ingredient that you’ll take away from Cantonese food, what would that be? I think it’ll have to be ginger. Ginger’s like one of my best friends in the whole world. It has so many uses from sweet to savoury, in drinks and in soups. I had some beautiful congee today with the most amazing hit of ginger in the morning and I’m like YESS. It’s such a beautiful thing. Also it’s quite hard to grow ginger in England, so it’s always romantic to have access to something that I can’t grow. What’s your favourite food in Hong Kong? Probably dim sum. It’s just a lovely world of beautiful things – the Italians have antipasti, the Spanish have tapas and you guys have dim sum. It’s so beautiful. I love dim sum as Sunday brunch, it’s the best thing ever. The diversity of it all. That’s definitely the favourite. 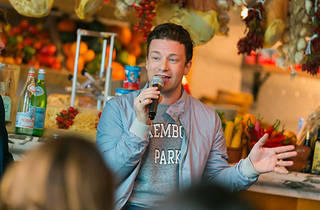 You weren’t physically here for the launch of Jamie’s Italian, whereas Gordon Ramsay was for the opening of Bread Street Kitchen. What took you so long to get here? Obviously there’s only one of me. So, first of all, I think it’s fair to say that I run more consistent and efficient restaurants than Mr Ramsay. He’s the type of guy who will turn up at the launch, do the jazz hands and disappear. I really like to act more like an owner than pretending to be a celebrity chef because it’s not honest. You’re not going to me on the line in the kitchen, let’s just be really honest about it. I never over promise and we don’t pretend that I’m there every day. Anyone that would presume I would be is misinformed. Of course, I always try and get there for the launch, but in actual fact it’s not very useful. All it does is it puts extra pressure on the team when they need to focus. You’ve been expanding globally and there’s no stopping you. Do you have any concerns about brand dilution? When you open multiple restaurants, after the second restaurant, you’re physically never going to be in that restaurant like the first one. I only work with people who I feel I trust and we only evolve at a speed that’s appropriate. We’re very protective and try to choose the right partners. When you have a restaurant in another country, it’s a bit like giving your baby away. And you only want to give your baby to someone you can trust. I have a bible that I’ve written about how we buy and how we purchase food and another bible about how we train staff, how we hire people. What’s really nice is that we have a really tight team [in Hong Kong]. Join Jamie’s Food Revolution; foodrevolutionday.com.